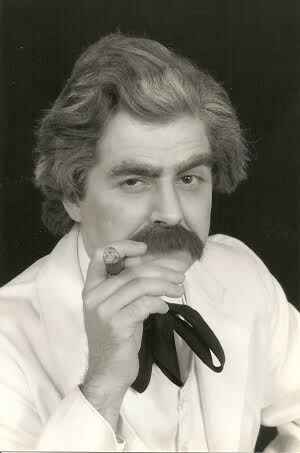 Ray Carver has been performing as Mark Twain for years. His collection of one-man shows bring out every side of Twain’s humor and observation in ways remarkably relevant to today. The most recent production, Life on the Mississippi, was the first production of Three Penny Theatre’s very first summer season in 2013. 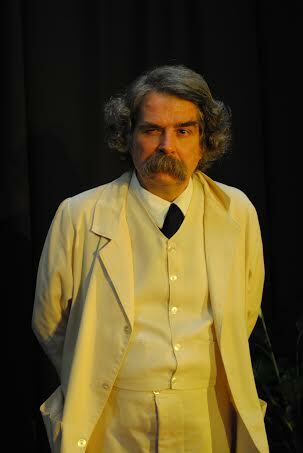 You can view a video sampler of Carver as Twain on Drama Tonight. Take a trip to the Mississippi River with this play about steamboating on America’s great river, told by the man himself that knew the river best, Mark Twain. Sit back and enjoy Twain’s tales of becoming a riverboat pilot before the Civil War and trying to master the Mighty Mississippi. Based on the author’s book Life On The Mississippi, this play follows young Mark from his hometown of Hannibal, Missouri into his quest for fame and glory on the steamboats that visited Hannibal every day. Along the way, as Twain tells in Act One, young Mark has to wipe away the stars in his eyes and actually learn how to work for a living, something which goes against his nature. But the young man does do it, and learns an invaluable lesson about life, which the storytelling author relates with his trademark wit and humor. In Act Two Mark Twain tells his tale of returning to the Mississippi twenty years after the Civil War. Starting his trip down in New Orleans he heads up river incognito, but quickly blows his cover when a pilot tries to tell him about alligators being the true friend of a steamboat. Twain continues on up river discovering how the world he knew has vanished, which is especially brought home to him in own hometown of Hannibal early one Sunday morning. “Life On The Mississippi – An Evening With Mark Twain” is available as a complete evening’s entertainment or as a 50 minute program that tells of Twain becoming a riverboat pilot. Either way, your audience will be getting the cracker barrel humor, one-liners, and funny observations about mankind that Mark Twain is known for world-wide. Only Mark Twain could find a connection between morals and cats that make up this thirty-minute play. What starts out to be a lecture on morals Twain turns around into a lecture on cats he’s known, all because of his daughter’s observation that it was “mama loves morals and papa loves cats”. Twain tells the story of how he learned to love cats and about his and Jim Wolfe’s run-in with a pair of them on an icy roof one cold winter night. The author’s stories are full of laughs and insight as he gets back to the connection between morals and cats in his own life. The play ends with an appearance by two of Mark Twain’s favorite felines. In this 30 minute play Twain looks back to what it means to be a boy by telling the tale of Tom Sawyer and the Saturday he had to paint the fence. Twain’s well-known story comes to life with the author himself playing all the parts – Tom, Aunt Polly, Sid, and all the neighborhood boys. The author also gives an insight into the actual models for his immortal characters in The Adventures Of Tom Sawyer. Mark Twain knew the Mississippi River backward and forward, and knew there was more to it than just the steamboats. In this 40 minute play Twain shares a section cut from his ground breaking novel The Adventures of Huckleberry Finn about Huck and the Mississippi raftsmen, who shared the river with the steamboats. Twain begins an author’s reading from his new novel about Tom Sawyer’s friend, Huck Finn, but quickly steps away from the podium and acts out the story, playing twenty different characters in a two completely different stories. A video trailer for Life on the Mississippi and a gallery of Carver as Twain is below.